A new modus to blackmail people into paying bitcoins is posing as a CIA agent who will magically take your imaginary troubles away. Consider this as your warning. 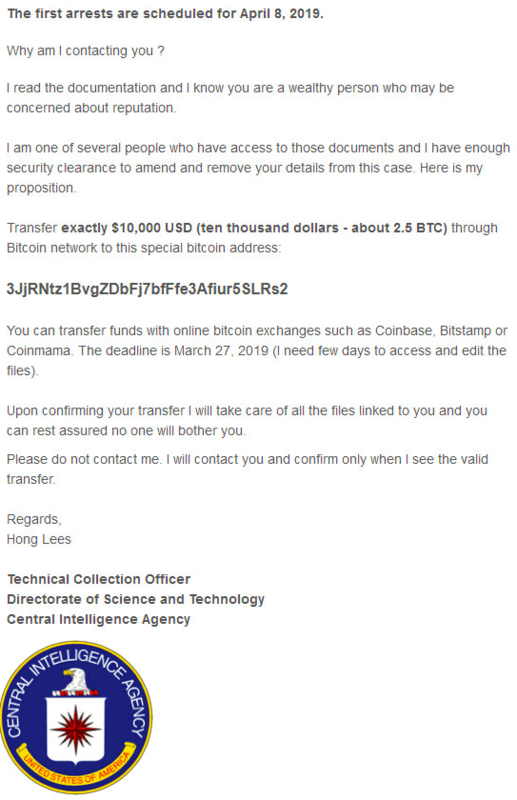 Some scammers are posing as the US Central Intelligence Agency (CIA) to fool those who have not known better into giving up $10,000 worth of Bitcoin. According to a Reddit post by r/sajber in a post entitled “CIA got me fam,” he received an email from a supposed CIA agent who is “one of several people who have access” to documents that may implicate him. The case that the email is talking about, Case #97416285, refers to an imaginary crime which includes a warning that he was tagged in an investigation that has supposedly distributed and stored pornographic materials that involve underage children. It’s interesting to note that the supposed email actually used masked email domain (@esxco.cia-gov.ga), as well as an image of CIA crest in the signature as if it would help build trust and establish legitimacy. Hong Lees said in the email that he is contacting people who are wealthy and who maybe are concerned about their reputation. Hong Lees prefers that the transfer to be made with online bitcoin exchanges such as Coinbase, Bitstamp, and Coinmama and that the transfer should be made before the deadline which is March 27, 2019. He, however, asked for a time after the transfer is confirmed to make the changes in the supposed CIA document, erasing the name and information of those who successfully made the payment. He made it clear that he needs “ few days” to access and edit the files, so any potential payment should be made well before the arrests start on April 8, 2019 (very convenient). For an average reasonable person, it is obvious that the email is a scam. The CIA will not be emailing perpetrators of sexual abuse, let alone ask bribe from them. If in the event they would, it’s very reckless if they use their government email or their real name. Thus, the best course of action is not to respond or better yet, report the incident to the authorities. The parallelism of this modus operandi with other modus done offline is uncanny. An illegal spamming activity has been calling residents in Milwaukee claiming to represent a local law firm by the name of “Anderson and Thompson.” The modus operandi is that the group will call random Milwaukee residents under the disguise of a local law firm to collect an old debt from a legal conflict and that the debt must be paid immediately. Similarly, the phone scammers are also using masked phone numbers (as with masked email addresses) to establish legitimacy. According to the report, the spammer is using a series of three phone numbers, all with a 414 area code, a local Wisconsin area code. Furthermore, the scam is also a slight upgrade from the infamous Bitcoin “sextortion” scam. According to this modus, a “magic pixel” has been smuggled onto the target’s computer, which then recorded videos of the potential victim masturbating. The masturbation videos wouldn’t be released as long as $1,900 in Bitcoin is sent to a specific address. It was first discovered in June 2017 and is estimated to have swindled more than $300,000 worth of Bitcoins from victims.